Check out “Aymmy in the battle girls” Summer 2016 items with Seto Ayumi & Una! Apparel brand “Aymmy in the batty girls”, run by fashion model Seto Ayumi, recently held its Summer 2016 exhibition. The theme for the event was “SKATE GARAGE”. Ayumi said, “This year is VAN’S 50th anniversary, and I also thought going for Summer’s beach and street culture vibe would be a good idea”. She came up with the design when she went to LA and saw the American high-speed skateboarding action movie “Slash!!”. Let’s check out fashion designer Ayumi’s recommended items, and fashion model Una who wore them! First up is the item of most interest: the patterned t-shirt series. Giving off a masculine vibe, these t-shirts are open-neck and have wide sleeves. 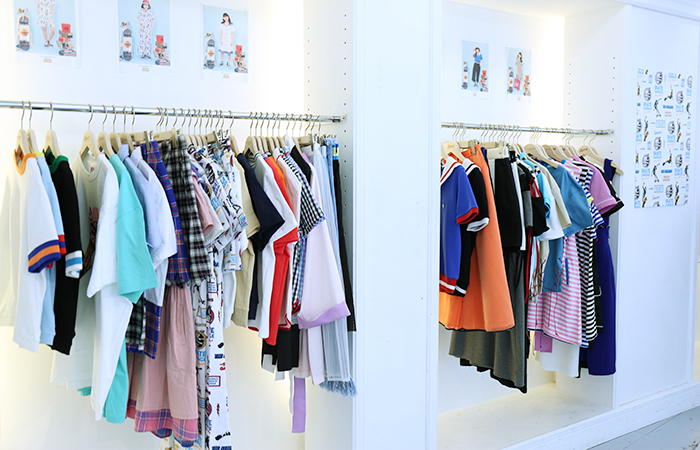 The one-piece styled t-shirts are a refreshing design and very girly! The polo shirts have a texture that makes them seem like old clothing. Turquoise-blue and orange have been used for this season’s theme colour. The checkered shirts also shout skater. The border and collar’s colour scheme on the cutsew are also noteworthy! The open shoulders give it a healthy summer feeling. The image for the embroidery is “skate garage”. The items worn by model Una at the exhibition are all-in-one! She looks cool and stylishly dressed in those monotone colours! There are lots of items to look forward to for Summer, so be sure to keep an eye on Aymmy this year!